Source: Confederate Soldiers Monument, Scotland County Courthouse. Image courtesy of the North Carolina Department of Cultural Resources. Photograph by Tom Vincent. The monument is composed of a marble statue of a Confederate Common Soldier placed atop a tall granite shaft. The soldier stands at parade rest with a steadfast and fixed gaze, holding the barrel of his rifle. The base of the shaft is inscribed on all four sides and presents bas-relief carvings of a cannon and crossed swords below the inscription on the front face. The front of the column shows a tall Confederate flag in bas-relief, unfurled and wrapped around its pole. General William R. Cox of Richmond, Virginia was speaker of the day, and a banquet was served to the veterans, the Sons of Veterans, and the Children of the Confederacy. The cornerstone had been laid in October 1910. It appears the monument was erected shortly thereafter as a news article from March 1912 called for funds to pay off debt for the monument that “has been erected more than a year.” It was not uncommon that sponsoring organizations would not unveil a monument that was not paid for. In this case the dedication took place almost two years after the memorial had been erected. The monument is now used as a meeting place during Confederate Memorial Day to honor the “Immortal 600”, a group of 600 Confederate soldiers who were used as human shields to protect Union positions at Morris Island, S.C. Three members of the Immortal 600 were from Laurinburg. 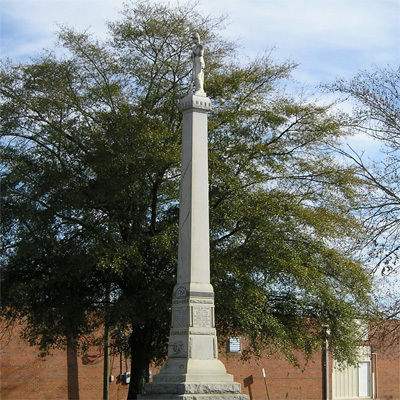 The monument stands at the corner of Roper and Biggs Streets, to the left of the Scotland County Courthouse that is located at 212 Biggs Street, Laurinburg, NC. When facing the courthouse the the Veterans Memorial is to the right of the Confederate Soldiers Monument with the Quakenbush Monument to the left of the Confederate Monument. The monument originally stood in front of the 1901 Courthouse in the center of the street at the corner of Main and Church Streets (see archival photograph). It apparently became a traffic hazard and was moved onto the courthouse grounds. It was relocated to the contemporary county courthouse sometime following its construction in 1964. The following image shows part of the monument just barely visible on the right side, in its location on the grounds of the 1901 courthouse and to the right of the Quakenbush Monument. In 2002, people gathered at the Confederate Monument to honor Confederate Memorial Day and the Immortal 600. A gun salute was performed by reenactors, and "Dixie" was sung prior to the laying of flowers on the steps of the monument.